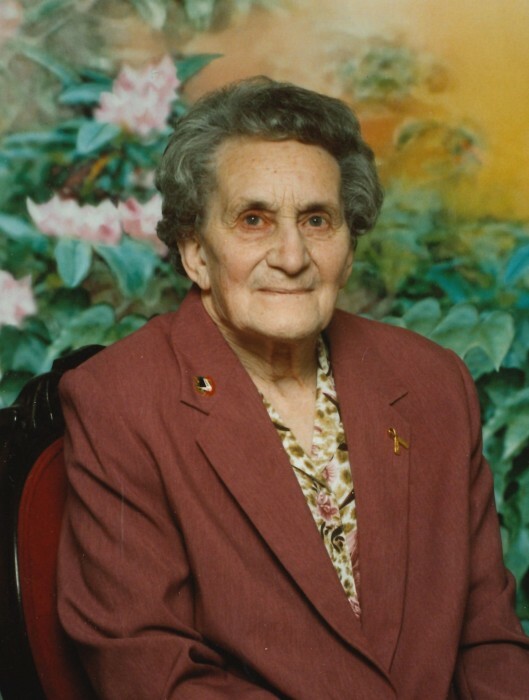 Irma Francis Fleming (Howes) passed away on February 2, 2019 at Northcott Care Centre in Ponoka at the age of 96 years old. Irma was born on May 9, 1922 in Bethany, West Virginia to parents Thomas and Ruth Howes. She is survived by her seven children, Larry (Linda) of Wabamun, Bonnie Stewart (Gordon) of Wetaskiwin, Roger (Jackie) of Ponoka, Dale (Jean) of Radway, Carol Robertson of High River, Louise (Shawn Graves) of Edmonton and Ida Mattson (Doug) of Victoria BC; 25 grandchildren; 40 great-grandchildren and two great-great-grandchildren. Irma was predeceased by her husband, James Fleming (Jim); parents, Thomas and Ruth Howes; sisters, Esther Soderstrom and Annis Kerr; and sons-in-law Roland Jubinville and James Robertson. In 1925 when Irma was three years old, the Thomas Howes family moved back to take over Willow Farm in the Hillside District near Millet Alberta. She attended Olds College and married James Fleming on July 7, 1945. They lived on Willow Farm and then farmed near Millet for two years and then in 1949 moved to Pickardville, AB. In 1964 they returned to Millet to take over Willow Farm upon her parents’ retirement. Jim passed away August 16, 1978 and Irma remained on the farm with son Roger and Jackie Fleming and their family. They all moved to a farm in Ponoka in 1988 where Irma lived until October 2015 when she moved into Rimoka Lodge in Ponoka. Irma moved into Northcott Care Centre in September 2016 after having a stroke. Irma loved farm life, gardening, flowers, Scotch Collies, wildlife, going for drives and most of all, her family. She spent many hours keeping in touch with family and friends with phone calls to see how everyone was doing and with weather updates. Funeral service: Friday, February 8, 2019 at 1:30 p.m. at Baker Funeral Chapel in Wetaskiwin, Alberta. In lieu of flowers donations can be made to Canadian Wildlife Federation or to the Alberta Heart & Stroke Foundation.